I am a guitar amp snob, and a tube amp snob to be specific. I’ve said it before and I’ll say it again: something very commonly misunderstood by non-guitarists and non-musicians is that a large part of an electric guitar’s tone comes from the amp. 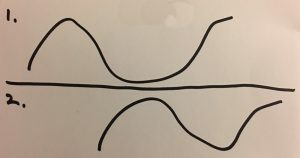 It gives it a color and a flavor, and part of that character comes from pushing it so that the tubes overdrive and create all kinds of juicy harmonics. Many believe that guitarists just turn up loud because they want to hear only themselves–and this is probably true of some–however, the truly good guitarists turn their amps up loud to drive those tubes harder. It’s not about being loud, it’s about getting great tone. The photo you see here is a view of the inside of one of our guitar amplifier isolation boxes. These boxes sit off stage so that our guitarists can use real amps and crank ’em. It keeps our stage quiet, but more importantly helps with maintaining a clean stage look for our video capture that goes out to our other campuses. About a year ago we began using the Radial SGI to connect our guitarists’ on stage to their remote amps. However, as you can see in the photo the box was empty for rehearsal this week. Actually three out of four of our boxes were empty. Several weeks ago one of our guitarists showed up with a new toy: The Line 6 POD X3 Live. The Pod X3 is Line 6’s latest iteration of their popular guitar amp simulator, and the X3 Live comes in the form of a pedalboard. I was initially skeptical because I’ve never been completely satisfied with the POD’s in the past, but the guitarist who brought it in is a fellow tone/amp snob so we hooked it up. I have to say I was actually a bit impressed with it. Out of the box it sounded pretty good, and with a little bit of tweaking it was sounding indistinguishable from the real thing. The popularity of the X3 Live has quickly spread through our guitarists, and tonight 3 out of 4 were using an X3 live. And these weren’t just any 3 guitarists; these were 3 of our most discriminating guitarists. These guys were playing boutique amps just a few weeks ago and now they’re just using an X3 Live. 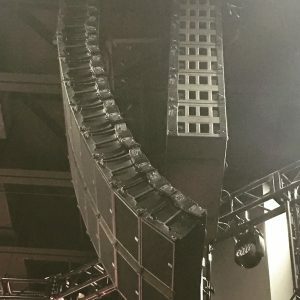 They love it because it sounds good, and it is incredibly easy to load-in. We’re liking it because it sounds good, it’s easy to hook up, and it looks a lot better on stage than some of the guitar pedal-fests. Of course this could just be another gear fad and the amps will be back in a few months. Time will tell, but I’m actually thinking about trading in one of my amps for an X3 to join the club…. First I have to say, I appreciate your blog greatly! I just recently found it and have been doing a lot of reading in the past week or so. North Point has become a model church for many churches, especially from the Southeast. I just live in Birmingham, so make the drive to 722 as often as possible, both to worship and see what new ideas I can get, because you guys are doing it right. In regards to this blog, I love the POD. I am a worship leader doing traveling and home church worship and for the ease of moving it around, you can’t beat it. As far as traveling, you never know what kind of venue you’re going to have, and not many people have offstage iso rooms, or any offstage space for guitar amps. Most of the time we will just the amp around backwards, if it must be on the stage, so at least its not hitting the front row in the face. However, I have used a POD for a long time, and it has gone through its share of changes and improvement, but its always been relatively good. I haven’t messed with the new X3, but after reading this I think I may go out and make the purchase! Ryan, I am so with you on the sound thing with past PODs. But I think they might have finally figured some things out with the X3. If I was heading into the studio, I would still opt for the real thing, but on stage with a decent PA the X3 seems a lot more viable than things in the past. On the button side, though, that might still be an issue. Time will tell so buyer beware. i will give them credit for the fact that things have improved from when the first flextone’s came out years ago, but they still sound pretty digital to my ears. like i said, even a DL-4 through a nice tube amp souds sterile to me. if they could find a way to make they’re stuff sound less processed, and also stand up to the rigors of stage use, they might be onto something. but for me, it’s also a matter of feel. they can continue to mimic the sounds of tube amps, and i appllaud them for that, because there are very practical uses for modeling vs. tubes (i, for example, use modelers to demo songs when my daughter is sleeping), but i don’t think they’ll ever be able to match the way it feels to play through a tube amp, and he way the tubes “give” with the dynamics of your playing. I think the key element in the good sound you’re getting is your “most discriminating guitarists” themselves. I say this a lot: tone is in the finger. Different people can pick up the same instrument, not touch any knobs, and sound very different. Might as well face it though; amp modeling is here to stay. We should be praying for Line6 (or anybody) to give us something really great and I’m praying the X3 is everything people are saying about it. 🙂 Can’t wait to hear one. Short rant: I really don’t get how so many guitar players seem to yearn for their Line6 to be the greatest thing ever. 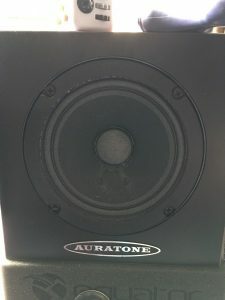 I understand buying one when you can’t afford the cool amp but ditching awesome sounding boutique amps for a device anyone can pick up at a local music shop? Baffling. Great blog Dave. Please keep us updated on the X3. I don’t find it so baffling, though. Boutique amps can sound amazing, but maintaining them isn’t always so. I think one of the motivations for one of our guitarists was when he spent the duration of the “message” moving a working speaker from an AC30 that died to a Marshall amp where the “amp” worked but the speaker had died so that he could play on the closing song. I remember when I was playing in bands on a regular basis it would take me at least 4 trips from to load in my all my guitars and my rig. Having it all in one package is very appealing. I know I wouldn’t permanently get rid of my favorite amp–and I don’t think our guys using the X3 are either–but in a live situation a device like the X3 is very appealing if the sound is good enough and it the reliability(yet to be proven) remains high. Our musicians are by and large professionals and will often gig between our Wednesday rehearsal and Sunday morning. I think some of the guys trying the X3 are only using it with us to prevent the loading in and out multiple times. One thing about our rooms is they are TERRIBLE for loading in and out. Not as bad as some of the clubs I’ve played where you had to go upstairs, but there is absolutely NO convenient way to get to our stages. You bring up a good point, Sam, about tone being all in the fingers. I’d be interested to hear how an X3 sounds in the hands of less experienced players to hear how it holds up. also, i’m curious to know if they’re still using their normal pedal setup going into the X3 or if they are choosing to utilize just the internal effects of the X3. Negative on Alex using one thus far. The guys who are using them have only been bringing the X3–no pedal boards with them thus far. BUT this is one of those things that I’m going to be very curious about to see where these guys are in 6 months. I’m still not sure if this is just a fad or the real deal. But I can say that for the first time I don’t roll my eyes when someone brings in a POD. Do you have a spec for your amp boxes? If so could you send it to me. I don’t have exact specs for them because they aren’t my design. Basically they are big enough to hold a large combo amp. 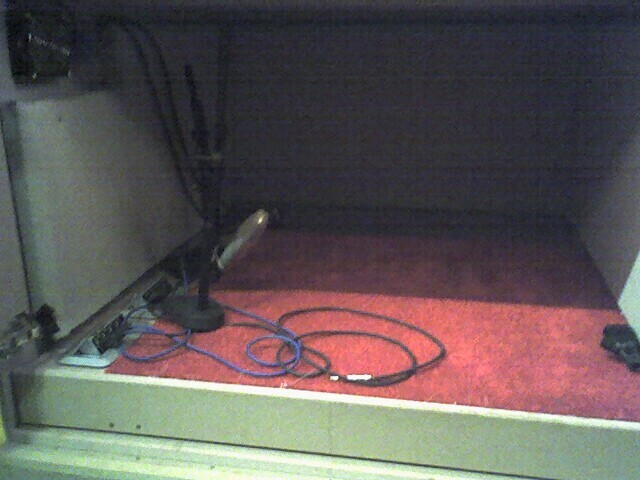 The boxes are lined with acoustic treatment. Inside the boxes are plates with connectors for sends and returns. Connectors are XLR and 1/4″. I will try and get some more photos and post them. Any more thoughts on the X3 Live. Is it sticking with your guitar players? Do you have any specs on those isolation boxes? 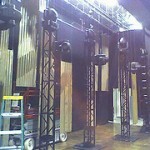 I am setting up an on stage system for my church and their new building. The system has already been setup, and it’s going to be wonderful IF we utuilize the right way. I’m trying to convince them to go with the isolation boxes for the very reasons you mentioned, and as a fellow “snob” I believe it to be VERY important. So, right now the main obstical is convincing a bunch of dudes from the 70’s that a 21 year old knows what he’s talking. When in fact I’ve been in Pro-Audio for over 5 years, so I’m just curious what your iso boxes consist of, if anything specific. Obviously the Radial SGI, and also if you have any additional picutes that would be greatly helpful as well. Thanks so much for your blog, I read it daily. I don’t have specs, and I keep meaning to take some better pictures. Chris Briley actually designed the boxes we have right now, and he then improved on the design for our other campuses. Basically, they’re just big, wooden boxes with acoustic treatment inside–when Buckhead moved out of their first campus we took some of the acoustic treatment and put it in the boxes. Prior to that the walls of the boxes were actually just old seat cushions from broken chairs. I prefer my pedalboard & amps. It is a nice toy to have but what pro acts are using x3’s live? 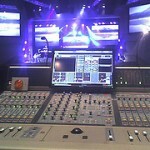 I’ve yet to see one on any stage other than in a worship band but those sound guys have to have total control right? Well, I think we’ve beaten this one to death now. Currently, all our guys who have started using the X3’s are still using them, and I haven’t heard any complaints from them. I still prefer a real tube amp, but I still haven’t minded the switch to the X3 thus far. Hey guys. I’ll drag this out even further. 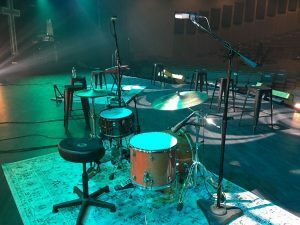 I’m Steve Thomason, one of the 3 guitarists sporting the X3 Live that night, and now it’s late October – I just stumbled on this blog – and I’m STILL using my X3 Live exclusively. I’ve been a professional musician for 26 years, I own a studio and HD video production company, and have played countless sessions over the years. I’ve owned at least 15 boutique amps over the years – and I’ve never personally had better tone than I have now with the Line 6. I’ve owned all of the PODs and have never really been inspired with the tone until now – they finally got it just right. And yes, I know great tone when I hear it – I’m very picky. I even use it in the studio with the digital direct out and I dare you to try and pick the real amp and the Line 6 one out in the mix. It does NOT sound digital – it responds like a real – great – amp. And – btw, I’ve had my AC30 blow tubes right before performances a few times over the years – so no gear is error-proof. This rig has been, so far.